As 2010 winds down, it's time to pick a Calgary Grit Person of the Year for the 7th consecutive year. The criteria is simple - a person who made an impact on the Canadian political scene in 2010 (ruling out obvious choices like the PM, or lame picks like "you"). But this was a tough year, with no obvious choice once it became clear that I couldn't contort the criteria to give the award to Sidney Crosby. Federally, 2010 was about as dull, meaningless, and mundane as it gets. No election. No crisis. No bold policies. No leadership races. Wake me up when it's 2011. If I had to pick a federal politician, I'd have to go with my buddy, Tony Clement. He was, after all, at the centre of the largest stories of the year - the Census, Potash, the G20 Summit. So convinced was I that Tony should be the Man of the Year that I sent him an application form - alas, he never filed it out, so I had to look elsewhere. Now, the "political person of the year" doesn't have to be a politician. Ivan Fellegi and Munir Sheikh could have been joint winners for turning the Census into the unlikeliest of issues. A wild card pick might have been the kids who set up the "anti-prorogation" Facebook group. But in both cases, Harper seems to have recovered and the probability of long term damage is low. As always, interesting candidates can be found in the provincial arena. Shawn Graham signed then unsigned the NB Hydro deal and, in the process, signed away a promising career. Danny Williams called it a night. So did Gordon Campbell, though he would have been a more deserving candidate in 2008 for his carbon tax, or in 2009 for his re-election victory and subsequent HST announcement. All good candidates, but none really define the year that was. In my mind, 2010 was all about municipal politics. Some people think municipal politics don't matter, but they must if people like Jim Watson, George Smitherman, Judy Wasylycia-Leis, Maurizio Bevilacqua, and Inky Mark leave provincial and federal politics for a chance to run (and in some cases, lose) municipally. Of all the mayoral races in 2010, none were more fascinating, surprising, or memorable than these two. In a city overrun with "pinko cyclists", a loud Ralph Klein clone from the suburbs drove away with it. In "redneck" Calgary, a Muslim Harvard graduate who teaches University and blogs about urban sprawl was the come from behind winner. Ford and Nenshi shattered stereotypes, prompting many to scratch their heads and wonder if we'd entered the world of bizarro politics. 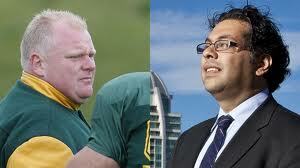 Though the differences between Ford and Nenshi are obvious, their campaigns were quite similar when you get down it it. They both ran as anti-establishment outsiders. They both defined themselves early with a clear message and understandable policies. They both filled a void left open by overly cautious front runners. Yes, the kinds of people who voted for them may have been different, but a vote for Nenshi or a vote for Ford was a vote for change regardless of whether you were a commuter from Etobicoke or a student in downtown Calgary. Beyond the immediate impact Ford and Nenshi will have on the 3.5 million Canadians they now represent is the effect their wins will have on the rest of the country. Is Ford's win a dark omen for Dalton McGuinty or an opportunity? What does Nenshi's victory in Calgary do to the already rocky world of Alberta provincial politics? What does this anti-establishment wave sweeping the country mean for Stephen Harper? In addition to these questions, the lessons learned from these campaigns will last...well, at least until the next memorable election. There isn't a politician in Canada who isn't thinking about "the gravy train" right now. And there isn't a campaign manager in Canada who hasn't looked at Nenshi's use of social media. But above all else, in a dreary year for politics, Calgary and Toronto gave us mayoral elections worth watching and worth talking about. Which is more than can be said about just about everything else that happened politically in 2010. I think Rob Ford is the obvious choice. By Anonymous, at 10:38 a.m.
Let me guess - you also considered Duckett but when you called he was eating a cookie. By Robert Vollman, at 10:47 a.m.
P.S. Great picks ... Nenshi getting elected in a fiscally conservative city on a platform of actually outspending and outinterfering the previous administration is amazing, and similarly, Rob Ford getting elected in a city that considers itself the capital of Progressivia are both jaw-dropping accomplishments that will have big impacts, and will not soon be forgotten. By Robert Vollman, at 10:49 a.m.
Great choice, Dan - 100% agreed. By Jacques Beau Verte, at 12:23 p.m.
Add for Nenshi that a much larger than usual percentage of voters actually came out and voted - 53% (in 2007 it was 33%). Those new voters now know how it feels to vote for a winner, and they might be more willing to vote in other elections. What percentage of the voters actually voted in Toronto? Was there a change? By Holly Stick, at 2:55 p.m.
Maybe if the form you sent to Clement were just the short form. By Anonymous, at 4:53 p.m. Excellent choices, Dan, they're definitely the right ones. Nenshi and Ford have affected the Canadian scene more than any others this past year, and that includes every single big and supposedly important leader in the provinces and Ottawa. For that alone they deserve awards. By Volkov, at 6:17 p.m. I'm biased but I would have went with Danny Williams. Between going to the US for heart surgery, to bashing Quebec to whoever would listen, to receiving super high approval ratings, to signing a huge hydro deal that screwed over Quebec, to ending one of the finest political careers in Canadian history while at the top of his career. By Progressive Tory, at 6:44 p.m.
Did you watch At Issue last night? Andrew Coyne stole your answer on top people of 2010. By Anonymous, at 8:13 a.m.
HS - Turnout was 53% in Toronto too, up from 39% last election. By calgarygrit, at 9:38 a.m.
By JBV, at 1:54 p.m. Discover not next to home how with the aim of execute a rearrange cellular phone lookup or a telephone lookup otherwise even a telephone number lookup lookup so whilst to find out who is reverse phone lookup up the rear so what time to human being with the purpose of has been calling you this whole time ok.
By Anonymous, at 10:28 a.m. Turn around telephone lookup web pages reminiscent of this lone force give you every kinds of phone search specifics so to you be able to in time stumble on absent their name, address, where they be, reverse phone lookup their current age as well as to a distinguished extent added. So after you require to facilitate spend a phone number lookup in our day, simply accomplish in no doubt so as to use up this beneficial tool that hit upon elsewhere each kinds of reorder cellular phone lookup particulars trailing to anyone these days. By Anonymous, at 8:03 p.m. I enjoy this nice switch phone lookup before phone lookup or else telephone number search spot. I can discover much of cell phone lookup substance on rearrange telephone search here in our day whilst I check absent this guide here. By Anonymous, at 9:50 p.m. Thanks for sharing your thoughts and ideas on this one. awriter.org Please keep posting about such articles as they really spread useful information.Thanks for this particular sharing. I hope it stays updated, take care. By Loran Fabyuel, at 12:31 p.m.
well as the road entertainers at Venice Beach front. By Christine JBray, at 5:28 a.m.
By mubeen, at 1:47 p.m.
By talha, at 1:48 p.m.
By Freddie King, at 8:51 a.m.
My name is Felix, I'm sure, you'll be interested in my lovely post! You have to read it, just follow the link. By Anonymous, at 10:03 a.m.